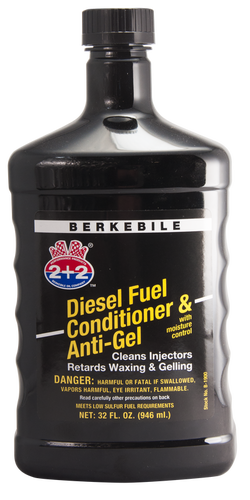 BERKEBILE 2+2® Diesel Fuel Conditioner & Anti-Gel... is specially formulated with a lubricating agent for use with low sulfur fuels. Retards gelling and prevents wax formation! Stabilizes fuel and prevents fuel line & filter icing! Lubricates pumps & extends injector life! Cleans wax & gum from pups, screens, & filters! Increases power while speeding injector life! Aids fuel flow for quicker starts! Allows more complete combustion while saving fuel! Works by using a combination of conditioners instead of just upgrading fuel oils & alcohol! Whenever possible, add BERKEBILE 2+2® Diesel Fuel Conditioner & Anti-Gel before filling tank with fuel for better fuel stabilization. Summer; One quart (32 oz.) treats 500 gallons, i.e., one gallon treats 2000 gallons. Winter; Add one quart (32 oz.) to every 150 to 250 gallons, i.e., add one gallon per 1000 gallons for 0 degrees F. protection; add 1 1/2 gallons per 1000 gallons for temperatures below 0 degrees F.